You have come to expect, value, expertise, wonderful designs, craftsmanship, and great customer service from High Desert Frameworks! framing. The same applies to our digital photo and fine art services. Get started now by uploading your images to Upload Files. We look at each image carefully and crop, resize, and make minor contrast and color adjustments at no additional charge. We are happy to complete minor photoshop tricks such as removing distracting items from your image. Just let us know! Need more extensive photoshop work? Just ask about our digital restoration services and we'll provide you a quote prior to starting the work. For a limited time we offer a 20% printing discount for printing that is framed at our shop. We use the latest high quality Epson printers, papers, and inks. Our inks are archival and our paper is the finest Epson creates with 98% of our papers archival in nature. We offer quick printing turnaround. Typically your photo or fine art print is ready in 2-3 business days and often 1-2 business days. Our normal turnaround time is 3-5 business days. Metal and Acrylic prints are typically completed in 7-10 days. We provide great value. We are a fine art printer and your images will look the best they can and we are far superior than the drug store photo services or big box retailer. With that said ... We are slightly more expensive but worth every penny. We print fine art prints, custom posters, photo enlargements, and business presentations from your digital files as well as photo enhancement and restoration services are available. For a limited time you can take 20% off printing prices for prints framed in our shop! Do you need a simple digital photo for printing and enlargement, a custom design services, or want to reproduce your artwork for resale? If so, we can provide professional results at very competitive prices. Stop by and drop off your high-resolution digital image on your camera, flash drive, CD, or DVD. We prefer high resolution tiff files, but can work from other formats. Get started now by uploading your images to Upload Files. For BEST Results: Upload images with resolution of 300 ppi in a TIF or JPEG format saved with Adobe RGB (1998) ICC color profile OR ProPhoto color profile. sRGB is ok but you will get better results from a Adobe or ProPhoto color profile. Call us if you have questions. 541-647-2191. Select the print media or paper/canvas. We use Epson quality media such as EPSON Enhanced Matt, EPSON Premium Luster, Epson 100% Cotton Rag, or EPSON Premium Canvas. We will size your images, make minor adjustments as necessary and have them ready for framing in 1-5 business days. If you need photo restoration, photoshop work or want more than minor color adjustments we’ll quote you a price based on expected time and materials. Our fine art printing is top of the line, utilizing Epson’s range of specialty, photo, archival and fine art paper. Only Epson archival High Dynamic Range inksets are use. For images greater than 8” x 10” our pricing is calculated per square inch and our pricing ranges from $0.10/square inch to 0.70/square inch. For example a 16” x 20” image with a 0.50” white border (total paper size 17”x 21”) would be 320 square inches and printed on Epson Photo Luster would cost $32.00. Frame the print and your cost is $$25.60 plus frame cost. If you choose different paper stock or sizing then the price will vary. Most all our prints range from $0.10 to $0.15 per square inch. What about pricing for standard sizes prints? Yes we print and frame standard photo sizes and have a great selection of “ready made” or photo frames to select from. For example our 4” x 6” prints are $5.50. Other sizes: 5” x 7” $6.00, 8” x 10” $8.00, 11” x 14” $15.40. If you request multiple of the same image/size/paper then we mark down the additional images 20%. You save on multiple images! Purchase a ready made, photo frame or custom frame when you print your image and we will reduce the print cost of your image by 20%. We can also scan your 4x6 (or larger) photo, 35mm slide, negative or Polaroid print and then restore the color and “clean up” the digital image if needed and then print and frame your digital file. For details and pricing on our scanning services please visit: Scanning Got digital images? Get started now by uploading your images to Upload Files. Questions? Send us an email and we will be happy to answer your questions. You may also call us at 541-647-2191 for details on our digital printing program. EPSON® Enhanced Matte, a non-archival paper which works very well for matte-finish photography. The paper yields highly saturated images, while maintaining highlight and shadow detail. EPSON® Premium Luster instant drying archival paper produces vivid, lifelike images similar to traditional silver halide prints. Premium Luster Photo Paper delivers highly saturated prints with high ink absorption rates and a wide color gamut. EPSON® Cold/HotPress Bright, an acid free, 100% cotton rag media with a bright textured finish. This acid-free paper features a bright textured finish and yields prints with a wide color gamut and deep blacks. EPSON® Exhibition Canvas Matte. Exhibition Canvas Natural Matte yields prints with a high DMax level and a wide color gamut without the use of Optical Brighteners (OBAs). The canvas is made from a coated polyester and cotton blend that provides accurate color and tonal gradations as well as deep blacks. Additionally, the canvas can be further coated to enhance image quality and prolong archival display life. We utilize the finest Epson media including their Signature Worthy and Legacy Fine Art Papers. It doesn't get any better! Additional print media are available and based on market pricing. ● Each metal print is printed using industry leading Epson equipment and inks. 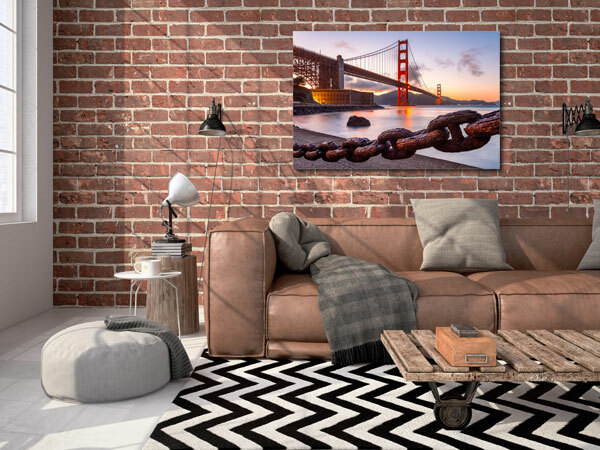 ● We offer the metal prints in all custom sizes from 3x5 inches to 40x60 inches. ● Each Metal Float comes with our easy to use cleat hanging system and felt pads to protect your wall. ● The Metal Float is printed on to high gloss Chromaluxe aluminum panels. ● The high gloss surface can be cleaned using most house hold window cleaners. ● Our HardBack Photo Mount option has a simple and clean look making it a great option for almost any application. The HardBack Photo Mount can be made in any custom size from 3x5 inches to 4x8 feet. ● The HardBack Photo Mount features a keyhole hanging system. ● Each piece comes with drywall screws for hanging and felt pads to protect your wall. If the art work is under 11x14" it will also come with a dowel hole and dowel for table top display. ● The HardBack Photo Mount is a 3/8" thick photo mount that starts as a paper print and is then mounted on to MDF board and then coated with a UV resistant laminate. ● Each HardBack Photo Mount is machined to have a 1/8" beveled edge that can be coated with one of our 30+ different edge colors. Stop by High Desert Frameworks to view out HardBack Photo Mount options! TruLife® Anti-Reflective Acrylic by TruVue From High Desert Frameworks! Learn more about High Desert Frameworks TruLife Acrylic Facemount product at: TruLife Facemounts! Hand Embellished Printed Photograhpy on Satin Canvas! We transform your favorite photos into original works of art on canvas. First your image is digitally enhance by hand with textural brushstrokes for a one-of-a-kind, painterly effect. Then further embellishment on the actual canvas portrait to really accentuate the brushstrokes — your image comes to life! Get started now by uploading your images to Upload Files. ↟Some important information from EPSON® website: "Actual print stability and longevity will vary according to image, display conditions, light intensity, humidity, atmospheric conditions, inks, and post-printing treatments. Epson does not guarantee stability or longevity. For maximum print life, display all prints under glass or lamination or properly store them. Required Overcoating: As with any Fine Art Canvas designed for indoor only usage, Epson canvas must be overcoated with a protective spray or laminate. Do not display in damp or humid conditions unless thoroughly coated, front and back, with a high quality solvent based liquid or spray overcoating. Overcoating will change print characteristics which may include color, gamut, gloss levels, and other visual characteristics. Overcoating may also accelerate yellowing." High Desert Frameworks! recommends framing all digital ink-jet prints with UV filtering glass as well as acid free matting and backing to help preserve the longevity of the print. Questions? Send us an email and we will be happy to answer your questions. You may also call us at 541-647-2191 for details on our digital printing program. Get started now by uploading your images to Upload Files. For BEST Results: Upload images with resolution of 300 ppi in a TIF or JPEG format saved with Adobe RGB (1998) ICC color profile OR ProPhoto color profile. sRGB is ok but you will get better results from a Adobe or ProPhoto color profile. Call us if you have questions. 541-647-2191.